Happy trails await your visit to New Hampshire. Ride horseback in spectacular landscapes with majestic scenery everywhere you look. Ride solo or on tours on well-maintained woodland trails and through forest and fields. Stables will get you onto the horse and into the equipment you need and many are set near cozy lodgings. From your equine perch you’ll see a variety of wildlife, maybe even a stately moose. There are programs and horses for younger riders and short pony rides with a lead rope for the smallest. In winter months, enjoy a magical sleigh ride. Travel majestic woodland trails by horseback when you stay at historic Franconia Inn just two miles from the quaint village of Franconia, New Hampshire. 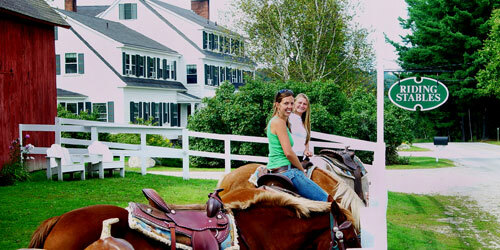 Franconia Notch Stables located next to the Inn offers one-hour tours five times daily, every day of the week. Two hour tours and private rides are also available and in the winter months you can enjoy a sleigh ride pulled by Belgian Draft Horse. You’ll traverse forests and fields with breathtaking mountain views and the regular sighting of deer, turkeys, turtles, and even moose. Children under eight can enjoy their own have a short pony ride with a lead rope. Reservations recommended. Enjoy the sweet comforts and amenities that await when you return from your ride.